A lot of buyers are just so pleased with what they experience when they wear the Nike Kobe 9 Elite. Some wearers are quick to comment that this shoe is comfortable. Like the first Air Jordan, a number of reviewers appreciate the lightness of the elite version of the Kobe 9. A good number of wearers say that this pair of Nike basketball shoes can be worn casually. A handful mentioned that this high-top shoe is supportive enough even for those with higher-than-normal arches. A pleased buyer says that this pair of hooping kicks from Nike is durable. At least one user says that he works out in these Nike shoes, and his experience is great. At least one reviewer felt that this shoe is a bit tighter than usual. There are comments that say that this shoe is too expensive. Buyers have a similar gripe with LeBron James’s sixteenth basketball shoe. The Nike Kobe 9 Elite truly deserves the word “Elite” in its name. It delivers as an elite basketball shoe should. It provides comfort and support. A very good bonus is that it is a pair of kicks that the wearer can rock casually. Because it’s made of more premium materials, this might be pricier than the usual, but based on the reviews, the price hike will be all worth it. I love playing in the Nike Kobe 9 Elite. They offer everything I personally want and need. For me, I like them but need more impact protection. The Kobe 9 is just an outstanding shoe from top to bottom. 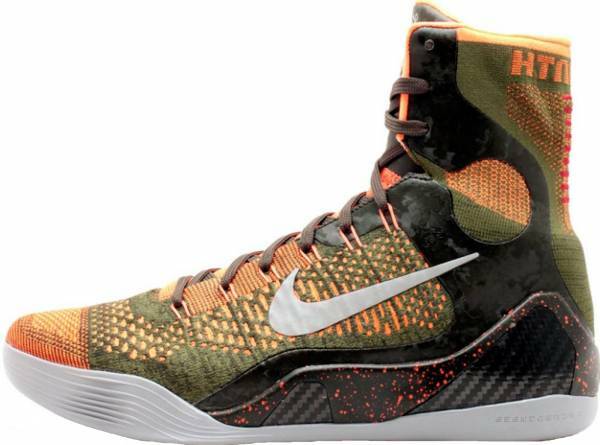 The Nike Kobe 9 Elite is an aesthetically appealing shoe that performs beastly on the court. It has Flyknit and Flywire in upper. These proprietary technologies work together to ensure a one-to-one fit and supportive ride. The midsole has Lunarlon, which is described as an ultra light cushion that provides both court feel and responsiveness. Finally, the outsole is made of durable rubber that is purposely made thinner to make it more flexible. Cushion. The responsiveness and impact protection that the Nike Kobe 9 Elite delivers come from the Lunarlon cushion in its midsole. This material is purposely made lightweight so as not to interfere with the wearer’s quick movements, which are sufficiently supported by the the shoe’s traction. Traction. Although made of rubber that is thinner than what is usually used on Nike basketball shoes, the outsole of the Kobe 9 Elite surely does not fall short in providing game-enhancing traction. In fact, using thinner rubber might have worked to the Kobe 9 Elite’s advantage because this setup affords the wearer flexibility, which is especially useful when the wearer is fond of doing cuts and quick sprints. The outsole features a unique traction pattern that looks like a fingerprint. This pattern maps out important pressure points and provides effective multidirectional tread. Length and Width. There are not a lot of complaints regarding the Nike Kobe 9 Elite’s length and width. Because of this, new buyers assume only very minimal risk when they go true to their sizes. Lockdown. The one-to-one fit of this shoe is further enhanced by its use of Nike’s Flyknit. This material is known to conform to the shape of the foot, leaving no space for possible internal slippage. The power of the traditional lacing system of the Nike Kobe 9 is effectively complemented by another proprietary technology called Flywire. Inspired by the design of suspension bridges, this technology allows the shoe to grasp the shoe better when the laces are tightened. Finally, an extended knit collar gives this shoe its high-top silhouette and support capacities. Comfort is really one of the top considerations for the design of this shoe. Aside from ensuring a one-to-one fit, the Flyknit material also provides high levels of next-to-skin comfort. The tongue is made of sandwich mesh, further ensuring a comfortable experience. There is also plush foam around the heel and ankle. The Nike Kobe 9 Elite’s focus on performance surely did not mean an abandonment of style. On the contrary, designers made it a point to integrate beauty with utility. Giving the shoe its unique aesthetic appeal is the colored threads that are integrated with the structure of the Flyknit. This clever integration results in a multi-color appearance will be a feast for the eyes. To match this, the midsole also features specks of color. Brand and signature Kobe Bryant elements are also on the shoe. Kobe Bryant’s signature and Sheath logo is prominently emblazoned on the tongue. The iconic symbol of the nine stitches that he got after an injury is prominently at the back of the extended knit collar. Finally, a stylized Swoosh is prominently on display at the lateral side of the shoe.